We all know that it's important to regularly learn new things, but often the busyness of life crowds out that learning and we settle into routines that make learning unnecessary. Fortunately, one of the things made possible by iOS 12 and the new Shortcuts app is that you can create your own custom "routines" of sorts with the help of Siri, and integrate daily learning into those routines. In that vein, the excellent dictionary app LookUp was updated this week to version 5, which takes advantage of Siri shortcuts in iOS 12 to offer access to the word of the day via Siri. The update also brings a new Collections feature, additional shortcut options, and more. The word of the day is one of LookUp's hallmark features, and each word in the app is beautifully displayed with custom artwork. Fortunately, you don't have to miss out on that artwork even when using a shortcut for the word of the day. Ask Siri what the word is, and the assistant will read the appropriate response while also displaying the word's poster from inside LookUp, all without leaving the Siri UI. Federico mentioned in his iOS 12 review that he's been using a word of the day function as part of his 'Morning Routine' shortcut. This is one of the best ways to put LookUp's Siri capabilities to use: as part of a larger shortcut created in the Shortcuts app. This way, the daily word can be paired with other information you may request regularly, such as the latest news, or your upcoming calendar events. 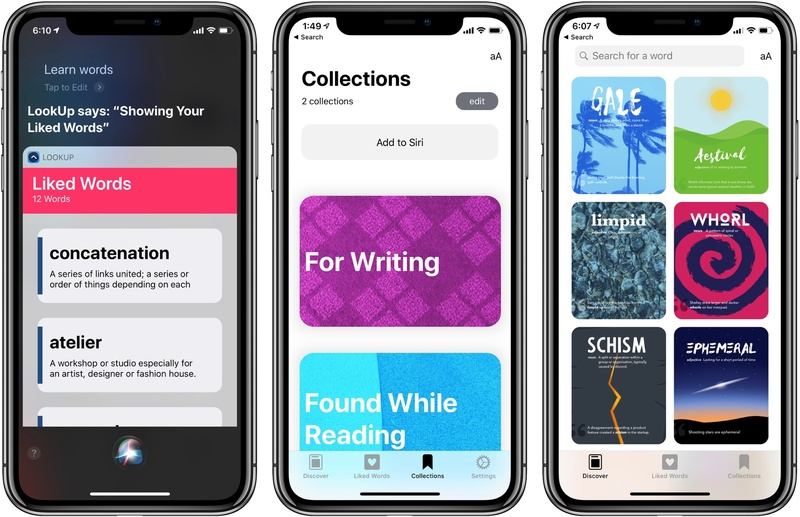 With iOS 12 now available to the public, and app updates featuring shortcuts support rolling out, there are a countless number of ways to put Siri to work for you. Whether you choose to make a morning, afternoon, or evening routine, or just set up an individual shortcut to hear the word of the day on demand. In addition to adding shortcuts support for the word of the day, LookUp can also create shortcuts for viewing your liked words, as well as launching straight into the app's machine learning-powered LookAround feature; the latter shortcut takes you straight into LookUp with the camera active and ready to identify whatever is in its sight. In concept this is fantastic, as you can set up a custom phrase so that asking Siri "What's this?" will load LookUp to identify and define the object for you. In practice, LookAround is still limited to a fairly basic database of items it can identify, so most likely if the app can identify something, then you can probably do the same yourself without needing its help. One of my favorite shortcut options provides the ability to pull a word from your clipboard and show a definition for it. Keeping your hands on the keyboard, you can use ⌘C to copy a word, then trigger your custom shortcut phrase via voice and have the assistant immediately respond. The definition is presented in a rich card inside the Siri UI, making it a great tool to have available while writing. In version 5 LookUp has also received a whole new dictionary source that provides better definitions, and more extensive contextual information through things like example sentences and technical notes. There's also a nice new feature called Collections, where LookUp users can add words to collections they create, thus curating their own libraries of saved vocabulary. Collections can also be accessed via shortcuts: you can set up one shortcut to view all your collections, and separate shortcuts to view the words contained in each collection. One feature I hope to see from LookUp in the future is support for the Siri face on Apple Watch. Accessing each word of the day via Siri is great, but seeing that word on my wrist multiple times per day would be an excellent passive learning mechanism. Limited for most of its existence to Apple apps only, then expanded to a restricted set of third-party apps in the last couple years, Siri has been long overdue for a coming out party. With Siri shortcuts, Apple is placing the power of the assistant in the hands of all developers, which in turn will put that power in the hands of users. LookUp is but one small example of the potential behind shortcuts, but it's a great one because it takes Siri to places it's never been. LookUp 5.0 is now available on the App Store.